My baby is going to college in a few days. This is a challenging moment for me. I am sure it is for him, too, but let’s get real – this is about me. 18 years I’ve been raising this kid, and now he’s leaving to have his own life. I don’t think I can take it. Instead of thinking about it, I’m going to organize and plan some things. This is my method of compensating for my grief and loss. Bed, Bath & Beyond – check! Pottery Barn Teen – check! Everywhere I go there’s a “dorm room checklist”. Luckily for me, I love checklists. Some things on the checklist I do not need to buy, such as “lounge seating” and “hair tool organizer”. My son’s room will be the size of a closet, and he has no hair tools to organize. There is one thing that is on NO lists, however. A homeopathic/naturopathic health and wellness kit. I made one myself, and I recommend you make one for your kid that lives away from home, too. First, you need the remedies. I recommend the Hahnemann Home remedy kit. It comes in a 35 remedy size, or a 50 remedy size. I splurged on the 50 remedy size. Why? Because that’s me, I always go big. Also, why not? These kits are amazingly inexpensive. They will last forever, and cover so many possible uses. 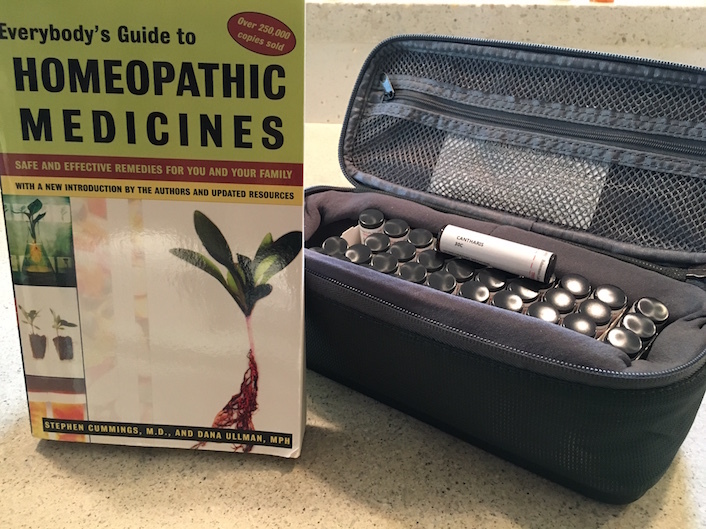 Washington Homeopathics also has a similar kit with 50 remedies and 100 remedies. These kits will cover sore throats, the flu, urinary tract infections, fever, stomach problems, coughs, colds, food poisoning, injuries and more. I have written a remedy guide, which details how to select a remedy. You can email me to get one. Next, you need a book or two to help your child figure out which remedy to use. In my case, he will probably call me, but it is good practice for him to figure out what to do for himself. My favorite book is Everybody’s Guide to Homeopathic Medicines by Stephen Cummings and Dana Ullman. Buy it from the author here. It’s easy to use and organized well. The book and kit are essential. When you are sick, you want the remedies on hand. No one wants to schlep out at midnight to try to find a remedy. Similarly, you need the book to tell you which remedy you need. They are the two indispensable tools of the trade. Additionally, I like to give immune support when my kids are sick. This is often the first thing I will do, since early signs of illness are often mild and vague, making it hard to find a good remedy match. 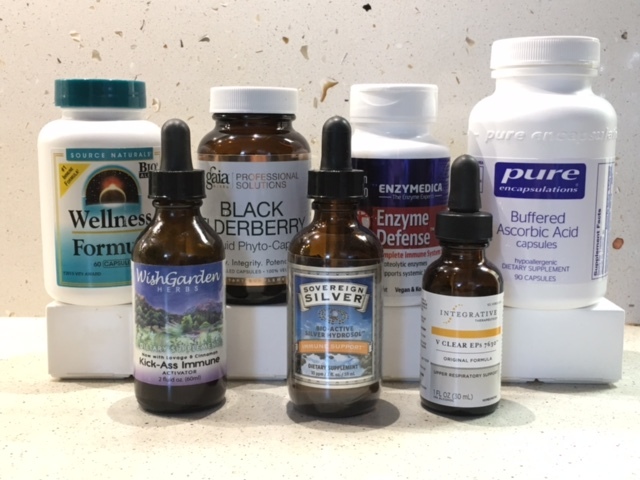 Here is a photo of the immune supplements I often use. They range from herbal immune boosters and sovereign silver to Vitamin C. The V Clear is a homeopathic product that has been shown to lessen the length of colds by several days. NAC helps lung congestion, which is an issue in our household. You can get all of these at Pharmaca – in person or online. Some of all of these in your care package will help when the sniffles hit. I also added a box of teas; Throat Cote, Gypsy Cold Care, etc. Add whatever else might be comforting. Think of it for: Food poisoning, influenza, stomach flu, viral illness. I’ve treated many colds, flus and viruses with Arsenicum. It’s also the number one remedy for food poisoning – think cafeteria food! It has so many uses, it’s really an indispensable remedy. Think of it for: Extreme burns; urinary tract infections. Cantharis is our number one remedy for urinary tract infections. This remedy can be a life-saver for someone suffering from a really painful UTI. Additionally, Cantharis is fantastic for burns, I have personally seen 2nd degree burns rendered completely pain-free with one dose of this remedy. Think of it for: Influenza, anticipatory anxiety (stage fright). Many situations at college will be first time experiences for our new college fledglings. Anticipatory anxiety can be an issue for anyone, and Gelsemium is a wonderful remedy for that. Additionally, it’s one of the main remedies I use to treat the flu, when the symptoms match, of course. Think of it for: Coughs, colds, nose bleeds, stomach flu. Phosphorus is useful for coughs that go to the chest and linger, as well as diarrhea and stomach upset. Nosebleeds are not as common in college-age children, but those who get them will be very happy to have a remedy on hand to stem the tide. An incredibly versatile remedy, Rhus-t is amazing for poison oak rashes, which can be a godsend when you’re itchiness is out of control. It’s also a wonderful remedy to help heal sprains and strains from athletics or just overdoing it. Finally, Rhus is a wonderful flu remedy, especially when you’re achy and restless and just can’t get comfortable. 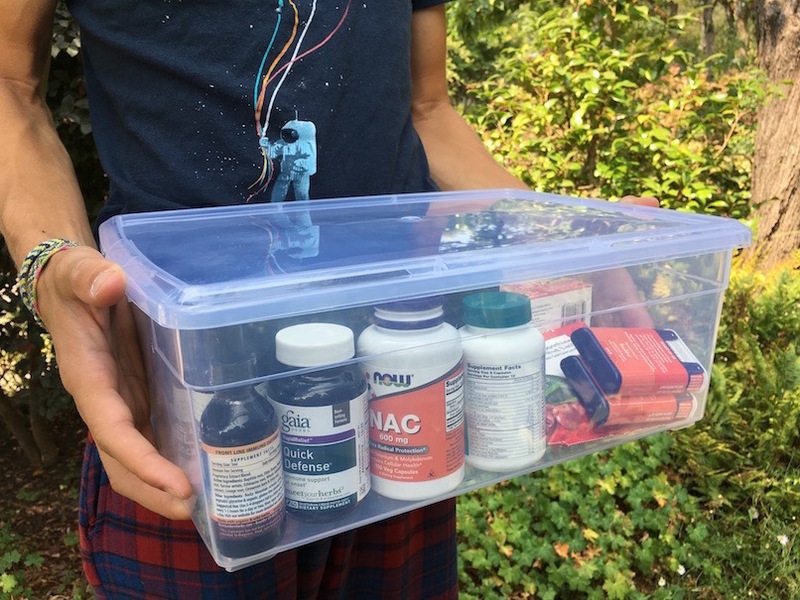 Please email me if you are interested in a homeopathic kit with remedy guide for your child young adult going out into the world to fend for him/herself.